Posted by Mike Gospe in personas. Posted by Mike Gospe in Integrated Marketing, Just for Campaign Managers, Leadership, Marketing Persona. If you are selling to CIOs or IT strategists, you may find this post of interest. Human perception is a tricky thing, for although teams may share a common understanding of their product portfolio, people often have a different idea of who they are selling to. And these differences may be slight, or they may be substantial. The Persona Exercise is one of the most effective (and fun) ways to ensure team alignment regarding the target audience. Focusing on the bullseye helps marketers avoid the trap of trying to be all things to all people. I was working with a cross-functional marketing team tasked to launch a new product on a very short runway. During a meeting to discuss messaging I asked about the the target audience. I got 5 different answers ranging from network engineers to CIOs in various size companies and industries. There was no time, nor budget, to entertain multiple target audiences, so we focused our discussion to find the sweet spot. What target audience subsegment offers the best chance for success? 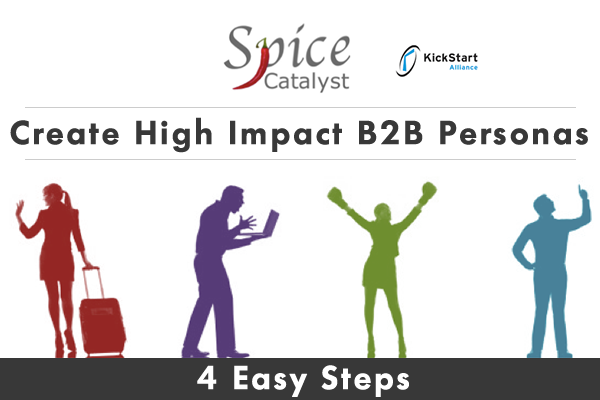 Where will it be easiest to win sales quickly and consistently? By the end of our discussion, we painted bullseye picture similar to that shown in figure 1. 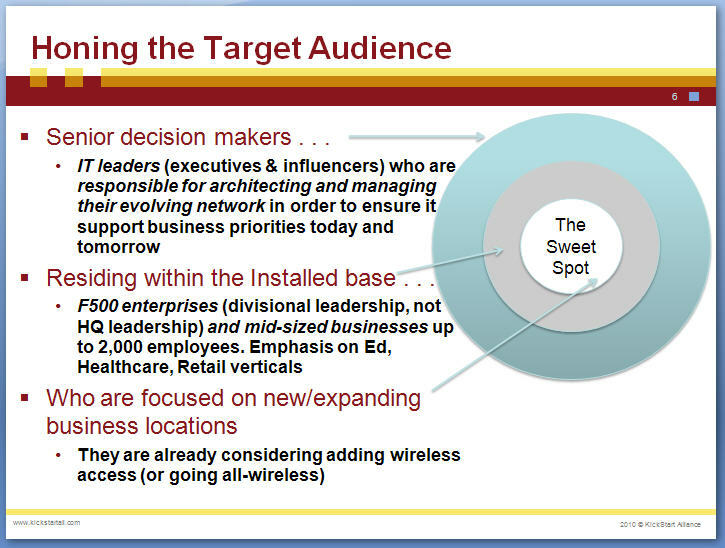 The sweet spot was not limited to job title or company size. Instead, the sweet spot focused on people who shared a common responsibility of managing today’s IT network while planning for the future. What is the persona’s pain point? What keeps them up at night? What 3 words best describe this person? Portrait of a senior IT manager responsible for the network architecture, who's also afraid of making a bad purchase decision. 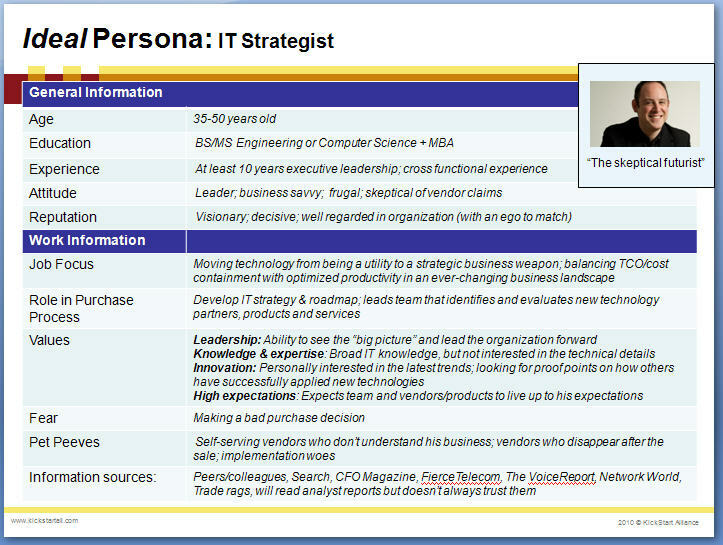 By the end of the discussion, we painted the persona shown in Figure 2. We had given life to the “Skeptical Futurist” — the embodiment to senior IT managers who are responsible for architecting their network, and who are troubled by fear of making a bad (or wrong) purchase decision. 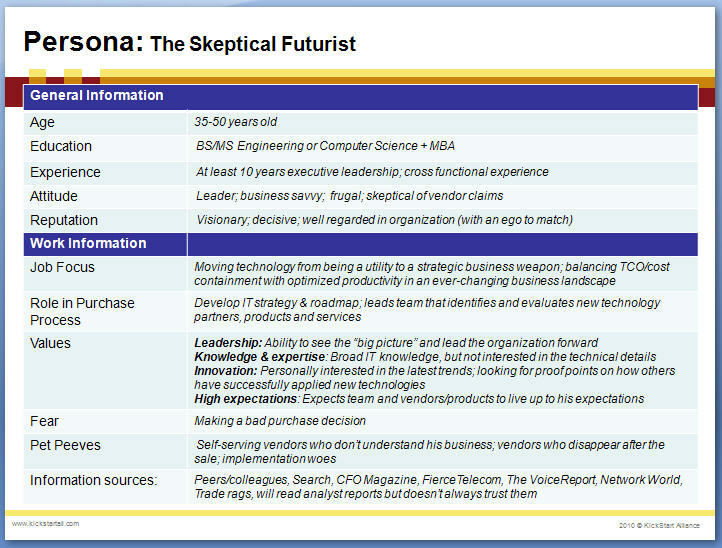 Drafting the Skeptical Futurist was an “Aha!” moment for the team. With the bullseye and persona in hand, 10 sales enablement tools took form — from “How-to-sell” presentations, to the corporate pitch, to the Competitive Quick Reference Guides, to the sales simulation training module. I’ve found that most marketers take short-cuts in describing target audiences. Mostly it’s a description like: “Fortune 1000 CIOs.” While this short-hand is common, it really tells you nothing about who these people are and what drives them. Building a persona is quick exercise that takes about 30 minutes. I’ve found it to be a fun way to challenge the team to dig deeper to understand who they want to sell to. This is just the beginning. Next, you’ll want to clearly articulate the problems that are “keeping them up at night.” Armed with this information, your messages will become more targeted and more relevant. You’ll be suprised how much better your marketing campaigns can be. Let me know your experiences with personas.